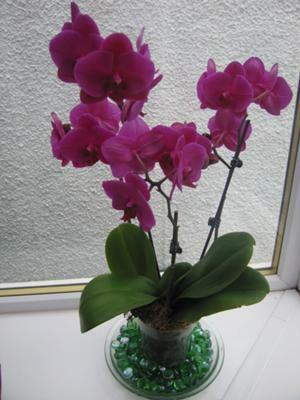 I found my beautiful Orchid in a cheap supermarket in April. It was the only one left and looked a wee bit sparse, I loved the colour so took it home. I looked up to the internet as I wanted to look after it and I have been rewarded with a very healthy looking specimen which has produced many lovely flowers for the last 4 months and still blooming fantastically well. It sits on my conservatory window with my other plants but I do move it when the sun is strong, I sit it on a clear glass saucer covered with green glass pebbles with water beneath the pot base. I dont know much about flowers but they all seem to thrive so I must be doing something right, I just hope after getting this far it can get through our cold winter (Scotland) and give me more pleasure next year. 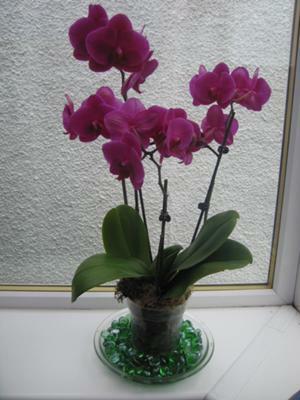 Thank you for sharing your story and the pictures of your incredibly beautiful orchid. I love the story and it is clear that this orchid loves you especially if it was a little sparse while in the shop. I love the color too. What a beautiful Phalaenopsis (or relative). You have indeed been rewarded for your choice. And I really commend you for learning what the plant needed to thrive. Clearly you have got it right. I suspect this plant will reward you with gorgeoous blossoms for a long time. Really good job! Thanks so much for sharing it with us all. I suspect that if you can generally keep it above 13 C. during the coldert part of your winter then it will flower again next year. Keeping it on pebbles in the saucer will help keep the humidity up around the plant if you use a wood furnace or forced air heat. And if need be you could supplement with a little light which would also raise the heat a little around the plant. Come next year, write back and let us know how it went.